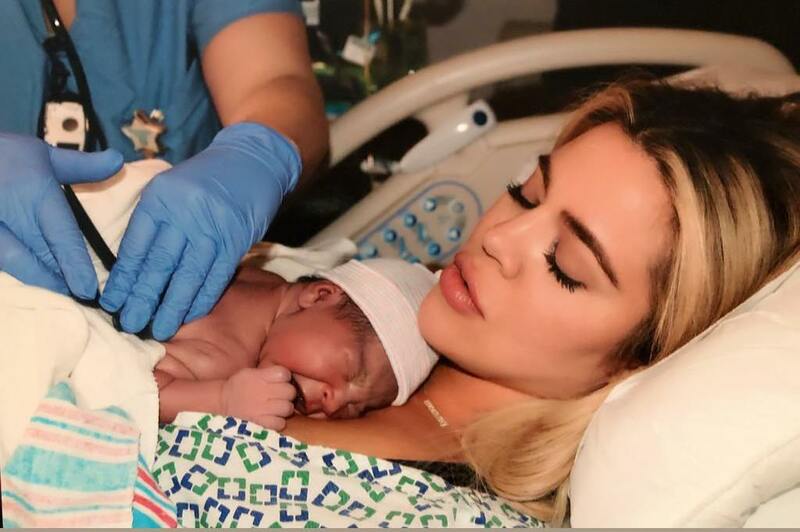 The newest episode of Keeping Up With The Kardashians showed viewers, at long last, exactly what was going on in the delivery room when Khloé Kardashian gave birth to True Thompson. As she does every KUWTK Sunday, Khloé was active on social media while the episode aired. And Khloé Kardashian’s family photo after giving birth is — and she agrees with all of us on this one — the most awkward photo on the planet. On Nov. 18, Khloé posted a bunch of photos from her delivery room in Cleveland from back in April when True was born. One shows her holding True for the first time, another shows Khloé’s best friend, Malika Haqq, holding little True, and there’s also a shot of Kris Jenner holding True while sitting in a rocking chair in the hospital room.